When it comes to facility maintenance you can be forgiven for putting office floors low down on your list of priorities. However, your floors go through a great deal of action on a daily basis – intense footfall, dirt and heavy furniture to name a few. So, ensuring that your office flooring is well maintained is integral, as this will keep your floor cleaner and safer for longer, as well as reducing the frequency of stripping and finishing needed. The average person will track over 1 pound of dirt into their office floor over a week period. Regular cleaning will remove a large proportion of the grime, but installing heavy-duty entrance mats will reduce the amount of dirt on the floor in the first place. If possible try to purchase matting that extends at least 10 – 15 feet from the doorway, as this allows a person a number of steps to get rid of the dirt before they step onto the actual flooring. Try to avoid dragging heavy furniture across the floor as much as possible. Either lift the furniture to move it, or if it is a piece of furniture that requires regular movement, add load bearing castors that will allow the object to be wheeled into position. Similarly, to prevent heavy furniture from causing indentations and marks onto your floor, ensure you place floor protector pads under their feet. Seems obvious enough but regular cleaning on your floors really does make a huge difference. 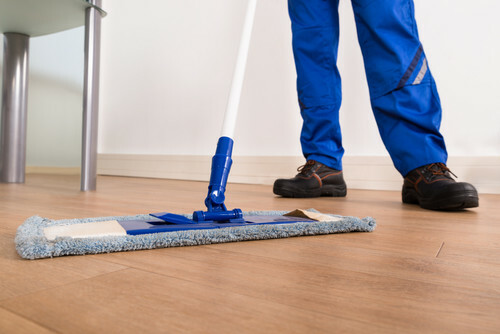 Sweep or vacuum your floor daily to get rid of any dirt or grit. The longer dirt is left the more it will be trodden deeper into the flooring and the harder it will be to remove. When mopping the floor make sure the mop head is soaking wet, do not wring it out. This will ensure that enough cleaning solution is being used so the floor is completely clean. Treat your floors with stain protection to reduce the chance of marks or discolouration. However, if a spill does occur, then clean it immediately. The longer it is left the higher chance it will permanently discolour and stain your flooring. Keeping up with regular cleaning is essential, but also set aside a date in your calendar for a deep clean of all the flooring. These cleans will target deep into your floors, reaching dirt and grime average cleaning products just can’t get at – your floors will look brand new. At MSL we offer a wide variety of hygiene and commercial cleaning services that are tailored to your individual needs. We not only offer day-to-day cleaning services, but also deep clean options such as Industrial Clean, that that won’t only enhance efficiency, but profitability too. We are also able to offer a property maintenance service that consist of a range of reactive, planned and compliance maintenance options. Through this, we can ensure that your facilities’ floors are kept safe and looking great, reducing the chance of any unexpected costs that may arise.